Newport Beach: Books On Tape, 1994. 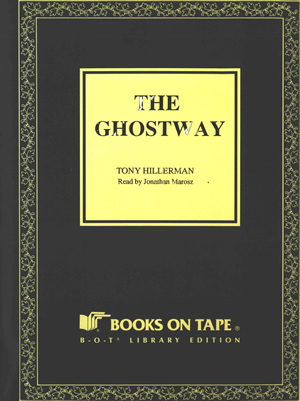 This is the Books On Tape library edition audiobook of The Ghostway. This unabridged version is read by Jonathan Marosz onto 7 cassettes of 1 hour each in length, for a total listening time of 7 hours. The cassettes are in a black plastic case with a cover insert printed in yellow and black on a dark brown background. The front cover contains the title, author, reader name, Books On Tape name and logo, and the library edition indicator, inside a border of leaves outlined in yellow. The book title, author name, and "Books On Tape" are printed on the spine of the case. The back cover is printed in black within a yellow rectangle on a dark brown border and displays the title, author, listening time, reader name, synopsis, praise from the Books On Tape Editorial Review Board, copyright information, and price. The Books On Tape name, address, and logo are printed in yellow at the bottom of the back cover.